Salsa music is a diverse musical genre that is popular across Latin America and among Latinos abroad. Incorporating multiple styles and variations, the term can be used to describe several forms of popular Cuban-derived music. Most specifically, however, salsa refers to a style developed in the 1960s and 1970s by Cuban and Puerto Rican immigrants to the New York City area and to stylistic developments like 1980s salsa romántica. The word salsa means sauce in the Spanish language and carries connotations of the spiciness common in Latin and Caribbean cuisine. Salsa's closest relatives are Cuban mambo and the son orchestras of the early twentieth century, as well as Latin jazz. 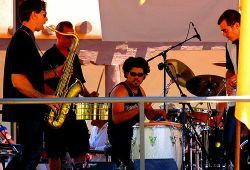 The terms Latin jazz and salsa are sometimes used interchangeably, and many musicians are considered a part of both fields, especially performers from prior to the 1970s. Today, salsa is performed throughout Latin America and many other parts of the world. In some countries it may be referred to as música tropical. Although the term can also be used more broadly, salsa came to describe a specific style of music in the mid-1970s as New York-based Latin musicians applied the classic big-band arrangements of the mambo era of the 1940s and 1950s, to a contemporary Latin music. It is often characterized by extravagant orchestration, driven by Afro-Cuban style percussion and a prominent horn section, backing a smooth but passionate lead singer. The structure of a salsa song is based on the Cuban son genre, beginning with a simple melody and followed by a section in which the performers improvise. 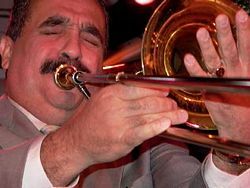 Classic salsa arrangements often used trombone as a counterpoint to the vocalist, creating a more aggressive sound than was formerly typical in Cuban music. Instrumentally, the trombone carried the melody, while the rhythm was most generally provided by bongos, congas, and timbales. New York and Puerto Rican salsa differed from the 1950s Cuban son style in various ways, such as greater use of timbales and trombones, the occasional use of Puerto Rican elements like the declamatory exclamation le-lo-lai, and frequent lyrics about barrio life. Salsa bands play a wide variety of songs. Most classic salsa songs, however, are modern versions of the son, a style of music that became popular in the Cuban province of Oriente, combining both Spanish and African themes. Like the son, salsa songs begin with a simple, songlike section followed by a montuno, a break featuring call-and-response vocals, refrains, instrumental solos, and jazzy improvisations. 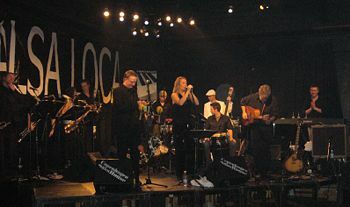 In the United States, the music of a salsa club involves a mix of various Latin styles, whether sourced from a live band or a DJ. A key feature in salsa is the percussion, which is played by a wide variety of instruments, including claves, cowbells, timbales and conga. A variety of melodic instruments are also used, such as a guitar, trumpets, trombones, saxophone, piano, and many others, all depending on the performing artists. Bands typically consist of up to a dozen people, one of whom serves as band leader, directing the music as it is played. Two to four players generally specialize in horns, while there are generally one or two choral singers and players of the bongo, conga, bass guitar, piano and timbales. Maracas or claves may also be played by a vocalist. The bongo player will usually switch to a kind of bell called a campana (or bongo bell) for the montuno section of a song. Horns are typically two trumpets with at least one saxophone or trombone. Salsa essentially remains a form of dance music. Thus, many songs have little in the way of lyrics beyond exhortations to dance or other simple words. Vocalists are expected to be able to improvise during verses and instrumental solos. Modern pop-salsa is often salsa romántica, defined partially by its sentimental, lovelorn lyrics. 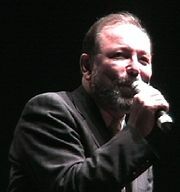 Salsa also has a long tradition of lyrical experimentation, with singer-songwriters like Rubén Blades using incisive lyrics about everything from imperialism to disarmament and environmentalism. References to Afro-Catholic religions, such as Santería, are also a major part of salsa's lyrics throughout Latin America, even among those artists who are not themselves practitioners of any Afro-Catholic religion. The Manhattan-based recording company, Fania Records, introduced many of the first-generation salsa singers and musicians to the world. Founded by Dominican flautist and band-leader Johnny Pacheco and impresario Jerry Masucci, Fania's illustrious career began with Willie Colón and Héctor Lavoe's El Malo in 1967. This was followed by a series of updated son and plena tunes that evolved into modern salsa by 1973. Pacheco put together a team that included percussionist Louie Ramirez, bassist Bobby Valentin and arranger Larry Harlow. The Fania team released a string of successful singles, performing live after forming the Fania All Stars in 1971. One of their 1971 performances at the Cheetah nightclub, was a historic concert that drew several thousand people and helped to spark a salsa boom. Two years later, the All Stars sold out Yankee Stadium. From New York, salsa quickly expanded to Cuba, Puerto Rico, the Dominican Republic, Colombia, Mexico, Venezuela, and other Latin countries, while the new style became a symbol of cultural identity for U.S. Latinos, especially Puerto Ricans. The number of salsa bands, both in New York and elsewhere, increased dramatically in the 70s, as did salsa-oriented radio stations and record labels. Popular performers like Eddie Palmieri and Celia Cruz adapted to the salsa format, joined by more authentically traditional singers like Willie Colón and Rubén Blades. The 70s saw a number of musical innovations among salsa musicians. Bandleader Colón introduced the cuatro, a rural Puerto Rican guitar, as well as jazz, rock, and Panamanian and Brazilian music. Larry Harlow, the arranger for Fania Records, modernized salsa by adding an electric piano. By the end of the decade, Fania Records' longtime leadership of salsa was weakened by the arrival of the labels TH-Rodven and RMM. Salsa had come to be perceived as "contaminated by fusion and disco," and took elements from disparate styles like go go, while many young Latinos turned to hip hop, techno or other styles. Salsa began spreading throughout Latin America in the 1970s, especially to Colombia, where a new generation of performers began to combine salsa with elements of cumbia and vallenato; this fusion tradition can be traced back to the 1960s work of Peregoya y su Combo Vacano. However, it was Joe Arroyo and La Verdad, his band, that popularized Colombian salsa beginning in the 1980s. The 1980s was a time of diversification, as popular salsa evolved into sweet and smooth salsa romántica, with lyrics dwelling on love and romance, and its more explicit cousin, salsa erótica. Salsa romántica can be traced back to Noches Calientes, a 1984 album by singer José Alberto with producer Louie Ramirez. A wave of romántica singers, mostly Puerto Rican, found wide audiences with a new style characterized by romantic lyrics, an emphasis on the melody over rhythm, and use of percussion breaks and chord changes. However, salsa lost some popularity among many Latino youth, who were drawn to American rock in large numbers, while the popularization of Dominican merengue further sapped the audience among Latinos in both New York and Puerto Rico. The 1980s also saw salsa expand to Mexico, Argentina, Peru, Europe, and Japan, and diversify into many new styles. In the 1980s, some performers experimented with combining elements of salsa with hip hop music, while the producer and pianist Sergio George helped to revive salsa's commercial success. He created a sound based on prominent trombones and rootsy, mambo-inspired style. He worked with the Japanese salsa band Orquesta de la Luz, however Chino Rodriguez was the first Puerto Rican—Chinese Salsa band on the scene in the 1970s, and developed a studio orchestra that included Victor Manuelle, Celia Cruz, José Alberto, La India, Tito Puente and Marc Anthony. The Colombian singer Joe Arroyo first rose to fame in the 1970s, but became a renowned exponent of Colombian salsa in the 1980s. Arroyo worked for many years with the Colombian arranger Fruko and his band Los Tesos. In the 1990s, Cuban salsa became more prominent, especially a distinct subgenre called timba. Using the complex songo rhythm, bands like NG La Banda, Charanga Habanera, and Los Van Van developed timba, along with related styles like songo-salsa, which featured swift Spanish rapping. The use of rapping in popular songo-salsa was appropriated by Sergio George, beginning with his work with the trio Dark Latin Groove, which "breathed the fire of songo rhythms and the energy of rap and soul into salsa." Salsa remained a major part of Colombian music through the 1990s, producing popular bands like Sonora Carruseles, while the singer Carlos Vives created his own style that fuses salsa with vallenato and rock. Vives' popularization of vallenato-salsa led to the accordion-led vallenato style being used by mainstream pop stars like Gloria Estefan. The city of Cali, in Colombia, has come to call itself the "salsa capital of the world," having produced such groups as Orquesta Guayacan and Grupo Niche. Salsa has registered a steady growth and now dominates the airwaves in many countries in Latin America. In addition, several Latino artists, including Rey Ruiz, Marc Anthony, and most famously, the Cuban-American singer Gloria Estefan, have had success as crossovers, penetrating the Anglo-American pop market with Latin-tinged hits, usually sung in English. Jerry Rivera's Cuenta Conmigo ("Count on Me") became the most-sold salsa album in history. The most recent innovations in the genre include hybrids like merenhouse, salsa-merengue and salsaton, alongside salsa gorda. Since the mid-1990s African artists have also been very active through the super-group Africando, where African and New York musicians mix with leading African singers such as Bambino Diabate, Ricardo Lemvo, Ismael Lo and Salif Keita. Salsa is only one of many Latin genres to have traveled back and influenced West African music. Leymarie, Isabelle, Cuban Fire: The Story of the Salsa and Latin Jazz. London: Continuum, 2003. ISBN 0826465668. Manuel, Peter. Caribbean Currents: Caribbean Music from Rumba to Reggae. Temple University Press, 2006. ISBN 1592134637. Morales, Ed. The Latin Beat: The Latin Beat: The Rhythms and Roots of Latin Music, from Bossa Nova to Salsa and Beyond. New York: Da Capo Press, 2003. ISBN 0306810182. Steward, Sue. "Cubans, Nuyoricans and the Global Sound." World Music Vol. 2: Latin & North America, Caribbean, India, Asia and Pacific. London: Rough Guides, 2000. ISBN 1858286360. Waxer, Lisa A. The City of Musical Memory: Salsa, Record Grooves, and Popular Culture in Cali, Colombia. Middletown, CT: Wesleyan University Press, 2002. ISBN 0819564427. This page was last modified on 11 August 2015, at 18:44.